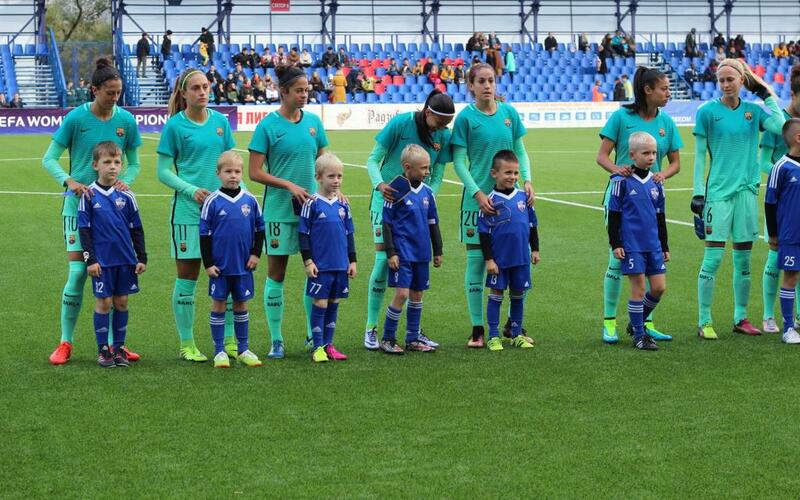 The FC Barcelona Women's team got off to a great start in the UEFA Women's Champions League, winning 3–0 at FC Minsk on Thursday in the first game of the tournament's last 32. JenniHermoso opened and closed the scoring, while MartaTorrejón scored in between, giving Barça a three-goal aggregate cushion heading into next Wednesday's return leg, set for 5.00pm CET at the Miniestadi. Jenni's 5th minute goal was the opening salvo in a match Barça totally dominated, proving to be technically superior in the face of a highly physical Minsk side. Marta added Barça's second in minute 31, converting a corner kick from the boot of MartaUnzué. The game's frenetic pace slowed in the second half until Barbara came on to add a dose of energy to the Barça attack. Andressa Alves came close to adding Barça's third in the final minutes but was denied by a tremendous save by Minsk's goalkeeper. Nevertheless, that huge insurance goal was added by Jenni in injury time, giving Barça a three-goal aggregate lead heading into the return leg in Barcelona. The second game is set for Wednesday, 12 October at 5.00pm CET.